I’ve been working in DC for over a month now and have made significant progress in integrating myself into a new firm, finding and renting an apartment, and buying essentials to furnish the apartment. Yes, a 42 inch TV is essential – especially as one ages, the eyes fail…. While it is true that setting up a new place is absolutely thrilling, sometimes picking out new flatware in 18/10 stainless on Amazon.com just isn’t enough. So on the advice of a friend, I signed up on meetup.com. wife and asked her what a trillium was. 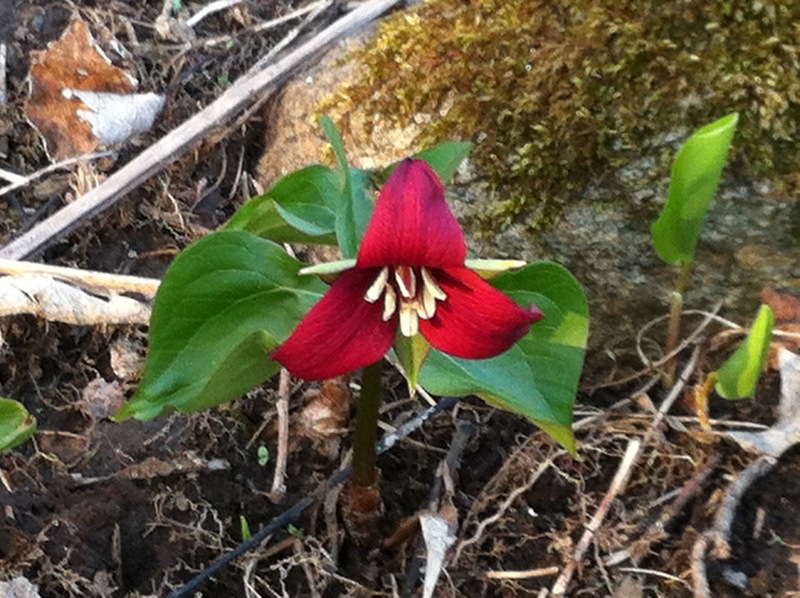 Shortly after asking my question, Karen sent me a picture of a trillium she took not too far from our house. Who knew! I confess that I was far less interested in seeing the trillium than the hike. The Capital Hiking Club has its own late model commercial bus for its outings. I caught the bus in a Northern Virginia Metro parking lot for the ride out to the G. Richard Thompson Wildlife Management Area. Two hiking routes were offered, a 6 and a 12 mile hike. I was going to do the 12 mile hike, but I didn’t want to get too far ahead of my “fitbit” competition. So far that hasn’t been an issue. When I arrived at the Metro lot, I saw several people, who were clearly dressed to go hiking, standing next to a car. I went over to introduce myself. Unfortunately, they were another hiking group. It turns out that three separate groups were meeting at the same lot that day. Clearly a lot of hiking demand around the Nation’s Capital. It was quite a diverse group that showed up for the hike. There were some younger couples, but I’d guess the median age was mid-to-late 40s. I wasn’t close to being the oldest (or in the worst shape). It was a very nice group of folks. The weather was pleasant, sunny and mild. While all the leaves were out in the suburbs of Washington, the mountains were still greening up. Interestingly, I was surprised at how few people could recognize poison ivy…even when hiking right through it. It bordered both sides of the trail in one section. Despite the amount of time I’ve spent in the woods, I have yet to have a reaction to poison ivy. No complaints from me. I hope I remain so fortunate. The only problem with taking a bus to a hike is that you can’t leave when you are done. The good news is that someone brought several coolers of beer and sodas for purchase while you waited. It was nice to talk with the other hikers and hear about some of their other hikes. One woman had recently returned from hiking Mount Kilimanjaro and was preparing to hike to the Everest base camp. That is a woman with clearly more disposable income than me. It was certainly an interesting and diverse group. No matter where you are, it seems like you can always find people who enjoy the outdoors. It may not be hunting or fishing, but being outside is still invigorating. I’m sure I’ll be going on several more hikes with the Capital Hiking Club in the future. Can you ever see enough trillium? As you will read in my next post, sometimes it is hunting or fishing, or at least fishing. If there’s water (and an Orvis store) you will find fishermen and women. And I have an Orvis store just down the street from my Virginia apartment. For the record, I did not select my apartment because of the Orvis store; really, Karen, I didn’t.